This is an update to the story of Bethany mare Cheyenne who was rescued from a nailed shut stall and found standing in two to three feet of feces and urine. She was the only animal in the barn area, authorities say. 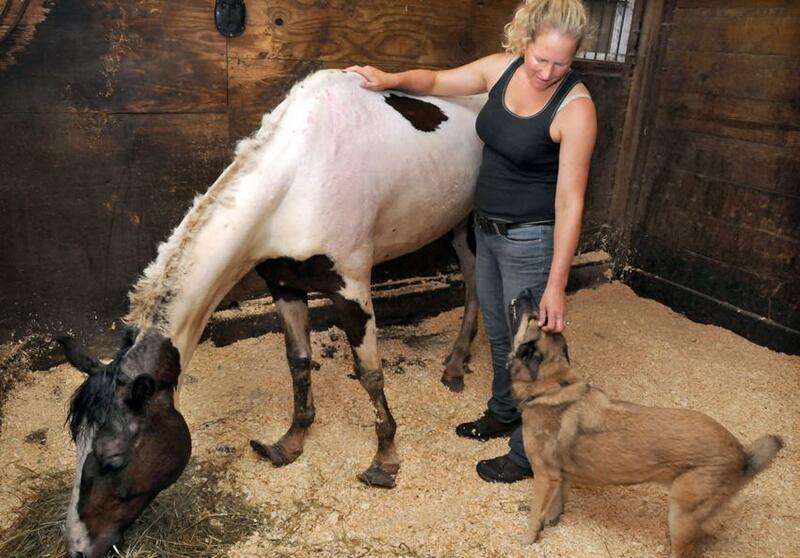 The horse was treated by veterinarian Stacy Golub Friday. Local horse rescuer Kathleen Schurman was with Golub and said Cheyenne got a good physical exam and her overgrown hooves were addressed. The horse had trouble walking Thursday, falling several times. “When she walks, she shakes and her heart rate goes way up, which is a sign of distress,” Schurman said. What first grabs attention is the nature and length of abuse and neglect, but that is soon replaced by reports of the mare’s resiliency and courage. Despite all the pain the horse is in, Cheyenne remains good-natured Schurman says. “Her disposition is lovely. She let us do everything we wanted,” Schurman said. And she loves (horse) cookies and her favorite flavor is peppermint. The horse most enjoyed being around other horses, Schurman noted. Why have authorities failed to arrest anyone? Law enforcement officials have not identified the owners of the horse. However, Merriman said the horse’s owner told authorities they meant to clean the stall. The horse did have water, although it was dirty, and there was hay in the barn but not next to the animal, officials said. So law enforcement have spoken with Cheyenne’s owners but are not releasing their identity. Does this mean they will not be pressing charges? Surely any interpretation of the local animal cruelty statute must make the inhumane treatment of Cheyenne a crime. Contributions to assist with the medical care for Cheyenne can be sent to Woodbridge Animal Control, 135 Bradley Road, Woodbridge, CT 06525. Can’t we start a petition to ensure this owner goes to jail. Or find out when they will be in court so we can stand outside to support that this owner goes to jail for a very long time. This makes me sooooo angry. No charges have been made. What we are doing Monday morning is contacting the authorities to see what the status of this is. We will need everyone’s help then. You can for sure count on my help, Viv…. It does, doesn’t it? That’s what I thought too. I’ve heard of this guy. Good work Ken. We were going to Google map it to see if we could tell what the place looks like. The report said the whole place is trashed out and the horse Cheyenne was the “only animal in the barn”. The street address is 77 Cheshire St, Bethany. I live literally 2 miles down the road from there and have horses. I drove up there today to check it out. The house is only 50′ from the road, yet it can’t be seen behind overgrown bushes. The house is practically falling down, it really looks like it has been abandonned for decades! It is mindboggling that somebody actually lives there. There is a 40yd dumpster in the driveway that is overflowing with garbage, and garbage strewn all over the lot. Oh, Ken. It must be shocking to you to think you have passed by there and she was nailed in her stall and you have no idea. It is a wonder the neighbor lady who phoned in even figured out something was that wrong that she called. The man must be in some distress himself. Not that I am defending him. The name Trowbridge sounds hauntingly familiar !!!????? I think this is just awful. someone should put her owner in a locked closet and not feed them and let them sit in their waste for monthsand drink dirty water and see how it feels. I am so happy the horse is getting the attention she deserves now . god bless her and you for taking her in! God bless CHEYENNE and all who help her. What a sweet girl she seems to be. OMG this happened here in Connecticut? Horrible! Why aren’t the names of the person who owned the stall given? Why should they be protected when obviously they knew the horse was in need. When a horse is standing in 2-3 feet of urine and feces you know it’s not just a weeks worth. This is animal neglect and abuse! They should be arrested! Its’ great to know Cheyenne is being cared for. Poor baby! They “meant to feed her”!!!! What do people have to do to be charged with cruelty? It is great to know Cheyenne is in such great hands now, it takes a very special person who also has courage , just like Cheyenne both of them have a long road ahead but through boths perseverance it will be filled with caring and wonderful discovery , one of the most rewarding feelings in this world , is to help those who cannot help themselves, the rewards are endless both will receive this is what life is all about LOVE and understanding………………..and most of all Caring !!!! !